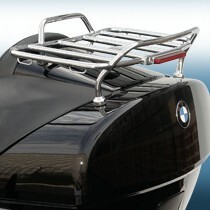 Add an elegant and functional addition to your 1998 and later K1200LT. With brazed thick-gauge steel tube construction, superb chrome plating, integrated bungee hooks for securing your gear and an LED brake light, the ZTechnik Trunk Rack is ready for your next trek. Add an elegant and functional addition to your 1998 and later K1200LT. With brazed thick-gauge steel tube construction, superb chrome plating, integrated bungee hooks for securing your gear and an LED brake light, the ZTechnik K1200LT Trunk Rack is ready for your next trek. 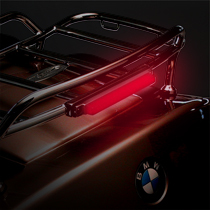 The ZTechnik Chrome Trunk Rack comes with an integrated, supplemental LED brake light. It includes BMW wiring couplers for easy, no-mess installation. Your motorcycle has one brake light... but two brake lights are better. 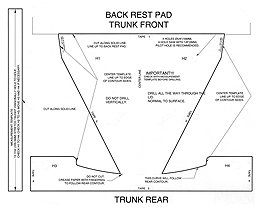 A drilling template is provided for foolproof installation. BMW wiring couplers for the LED brake light and complete instructions are included. Mounting is simple and secure. Instructions, drilling template, and all mounting hardware included. Also includes BMW wiring couplers for the LED brake light.